This morning, Thai Prime Minister General Prayut Chan-o-cha visited Phuket in the wake of the tragic boat incidents that took place on 5 July, 2018. 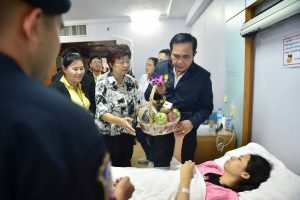 The Prime Minister also visited Vachira Phuket Hospital to meet some of the injured tourists and families of those who have lost their lives in the tragic boat event. With immediate effect, the Phuket Governor is to head the search and rescue command centre. Any government and private organisations wanting to join the operation must obtain prior approval from the Governor. All the related sectors are to step up precautionary measures for tourists’ safety and security. From the Prime Minister’s meeting with Ambassador Lyu Jian of the Embassy of the People’s Republic of China in the Kingdom of Thailand, this event would not affect the confidence of Chinese tourists on Thailand as a destination. The Chinese government urged the Thai government to step up efforts to alleviate the situation and come up with tighter measures to prevent the recurrence of tragedy. The Chinese government is willing to provide support to the Thai government on the matter, if required. The Prime Minister has promised the Chinese government to find the cause of this tragic event, and to bring the culprits to justice. All agencies responsible for tourism-related standards nationwide are to step up efforts in providing tourists safety and security and preventing any further unfortunate events from occurring. Prior to today’s visit to Phuket, the Prime Minister had issued a statement expressing his “sympathies and deepest condolences” to the families to those who died in the Phuket boat incidents. The search for survivors continued today by air, sea and land to find the remaining missing people. As of 12.00 Hrs., today, 42 people were confirmed dead, and 11 remained missing. TAT is monitoring and assessing the situation and will be providing further details as the situation develops. In the meantime, we would like to encourage travellers to obtain information from various sources to get a balanced understanding about the reality on the ground in Thailand, so that they can plan their trips accordingly.